“The After Effect” is a 2 day Movement Theatre Intensive. It is geared towards curious beginning and intermediate movers/dancers and performers who want to explore new grounds in a safe and playful environment to dig deeper into the mechanics to step a little out of their comfortzone. This edition teachers Tjarda van Straten and Nadîja Broekhart (HipSick’s Artistic Core) will work with the theme and material of HipSick’s new show PUPPIES FOR SALE which will premiere in June 2018. During the intensive we will be working on body awareness. Through exercises in where your own input is key, we will be creating short sketches according to the theme of PUPPIES FOR SALE. We will be working in small groups and will “show and tell” regularly. This contributes to becoming aware of what body language can achieve. In addition we will work on optimizing usage of space, movement qualities, improvisation and performing while facing an audience. On Sunday we will make a short performance on the material created during the intensive! The result will be shown on Sunday at 17hr and is open for audience. HipSick creates physical performances in which the fear of losing control is the starting point. The work is a combination of performance, dance and theatre: non spoken, visually raw and at it’s best on unusual locations. Level: all levels are welcome, we just need your enthusiasm! Your payment will reserve your spot in class. Tjarda will focus on movement fundamentals, conditioning, drills, layering, posture and alignment, just to name a few: solid technique taught in her magical mix of serious knowledge and fun exercises – whether you’ve never done it before or whether it helps you out of bad habits that snuck in over time. Techniques based on Tjarda’s research at the New York Laban/Bartenieff Institute of Movement Studies are employed, bringing attention to your use of movement. 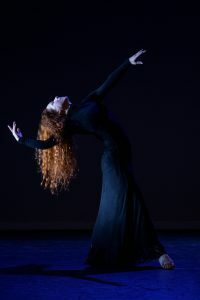 At the end of this workshop day we will learn a challenging combo in which Tjarda incorporates various dance styles, laced with her particular way of moving. This way you will be better able to create dynamics in your own future routines, staying true to your unique choices. Let’s dance!! A fun day to step outside your comfort zone and push your boundaries to the next level! Tjarda is well-known for her innovative choreographies and creative movement vocabulary. But next to creating dance performances, Tjarda is also the Movement Director of HipSick Unusual Theatre, where she creates (special themed) movement performances and shows in collaboration with her partner in crime Nadîja Broekhart, who is the founder and Creative Director of HipSick Unusual Theatre. During this workshop day Nadîja will be co-teaching alongside Tjarda to dive into the world of movement theatre with useful tips & playful excercises. We will also be looking at creating concept and how to integrate this knowledge into your own choreographies. Nadîja & Tjarda crossed paths in 2007 and have been inspiring each other ever since. Both having their own discipline they started to work together within HipSick Unusual Theatre to combine their skills. Benefit from their years of experience in creating performances and choreographies. Be ready to inspire yourself and others! TJARDA is a thoughtful and genuine choreographer, dancer, instructor and coach with a broad-minded curiosity towards fusing dance. She is a Certified Movement Analyst (CMA) in the Laban/Bartenieff Movement System and uses this knowledge as a clear framework in her teaching, where the emphasis lies on the connection between the student’s unique selves and their expression through movement – the intent behind it and the quality it produces, making her a welcome guest all over the world and at home thoughout the year. Her nomination for Most Promising Upcoming Choreographer with Exquisite Skills by The National Institute of the Voluntary Arts in 2008 has led Tjarda to receive several grants to expand her knowledge and to develop new projects, such as her 20-minute pieces “LIGHTS” and “Movement for Humanity”. Tjarda regularly gives individual and group coaching sessions to help dancers develop growth. NADÎJA is the founder and Creative Director of HipSick Unusual Theatre and has been studying her own personal mix of performance skills by attending various different courses such as mime, physical theatre, movement expression, clowning and butoh to create her own uncommon style of performance art & visual theatre. HIPSICK Unusual Theatre is a Rotterdam based company which brings a combination of dance, absurdism and visual theatre to the floor while combining artists from a wide range of disciplines. Unorthodox theatre is to be expected from this rich blend of backgrounds working together. In our shows we either normalize taboos of society or zoom in on elements of daily life. Identification plays a major role in our content, as well as a recurring theme of the distorted view of reality. The shows are eccentric, dreamy yet sharp-edged, but most of all create a profound atmosphere. This atmosphere is built on the dynamic interaction between physical performers, minimalistic costumes, progressive music, custom lighting, bizarre styling and dynamic choreographies. Please send an email to tjarda.nu(at)gmail.com to sign up. Your spot is reserved after payment. LIMITED space available, so don’t hesitate too long!